On 1st September 1520, Margaret of Austria, sister of Philip the Handsome and governor of the Low Countries , signed a contract with the painter Bernard Van Orley and the weaver Pieter de Pannemaker for both these masters to weave four pieces on the subject of the Passion of Christ. 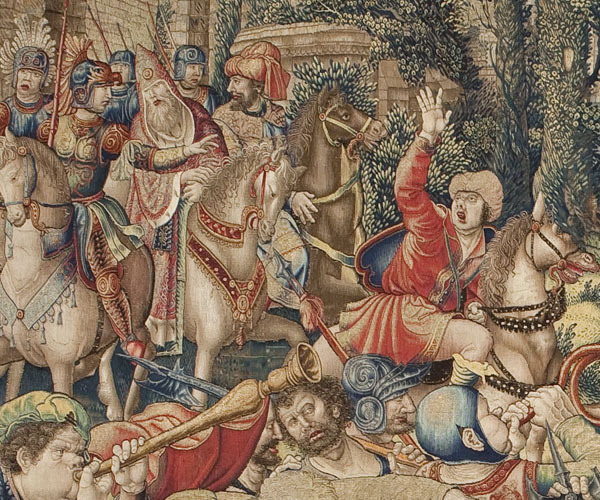 Due to their dimensions, this series was also known as Margaret of Austria’s Square Passion. 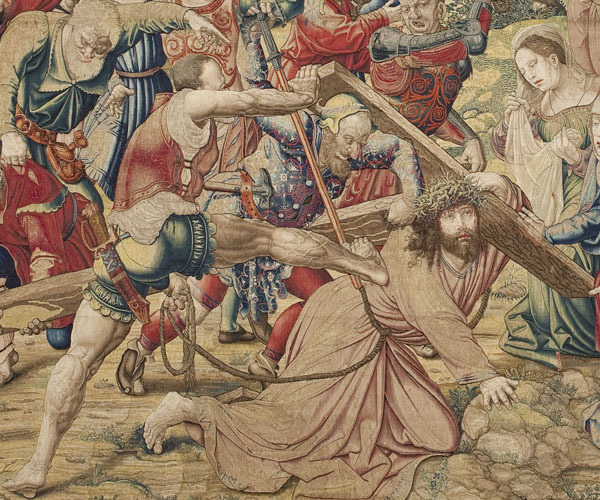 The two tapestries that commence the cycle, ‘Prayer in the Garden’ and ‘Fall on the Road to Calvary’, were in fact designed and woven after the two that conclude the cycle (‘Crucifixion’ and ‘Descent’). The cartoons by Bernard van Orley, a favourite painter of the Governor of the Low Countries, arrived in Brussels in 1516. They encompassed the figurative tradition typical of the Netherlands, the new expressiveness of Albrecht Dürer, and, above all, the Italian influence from the cartoons of Raphael’s Acts of the Apostles. 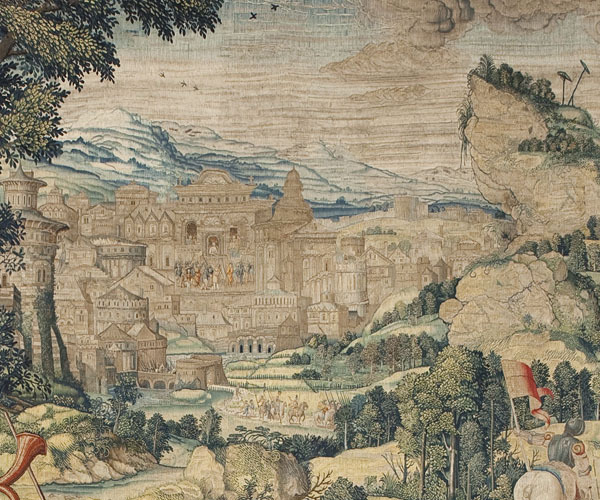 Pieter de Pannemaker, weaver by appointment to the Governor and founder of the most celebrated dynasty of Brussels weavers, demonstrated his skill and ability with this tapestry, extremely rich in gold threads and silks of excellent natural tincture. 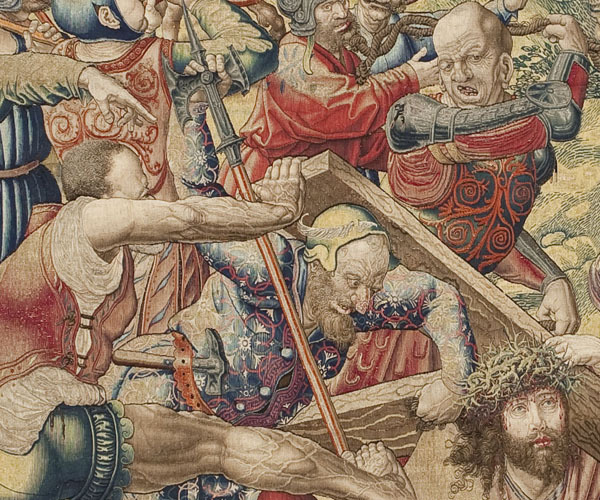 The influence of Dürer and Raphael is apparent in these compositions by Van Orley, whose dramatic and expressive effects further enhance the religious sentiment transmitted by the scenes in this Passion of Christbelonging to Margaret of Austria. The sister of Philip the Handsome and governor of the Low Countries, Margaret of Austria contributed to the royal collection of tapestries when she arranged for some pieces which decorated her palace at Mechelen to be delivered to Charles I of Spain, her favourite nephew. He, in turn, gave them as a wedding present to his wife Empress Isabella of Portugal in 1526, by means of his jewel warden Diego de la Cuadra. P. Junquera de Vega and C. Herrero Carretero, Catálogo de tapices de Patrimonio Nacional. Vol. 1: Siglo XVI, Madrid: Patrimonio Nacional, 1986, pp. 49-53. G. Delmarcel, “De Passietapijten van Margareta van Oostenrijk (h. 1518-1524). Nieuwe Gegevens en Documenten”, Revue Belge d’Archéologie et d’Histoire de l’Art, Vol. 61, 1992, pp. 127-160. C. Herrero Carretero, Tapices de Isabel la Católica. Origen de la colección real española. Tapestries of Isabella the Catholic. Origin of the Spanish Royal Collection, Madrid: Patrimonio Nacional, 2004, pp. 59-65.